Lasers are one of the hottest new items in the jewelry industry. 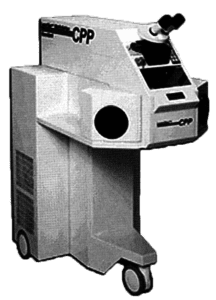 This relatively unknown technology among jewelers and jewelry manufacturers just a few short years ago is now receiving notoriety in our industry today. One cannot open a trade magazine without seeing an ad for lasers. Most all of the trade shows have at least one laser manufacturer exhibiting and demonstrating the latest in laser technology. So, what is so special about laser welding? How can lasers benefit your business? Is there a proper technique to use when laser welding most items? 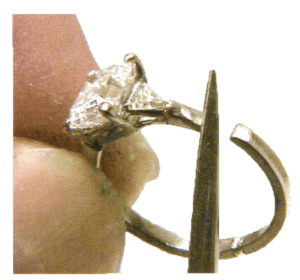 With most lasers priced inthe mid 20k to low 30k price range, laser welders are a major investment for most jewelry repair shops and jewelry manufacturers. Though they carry an expensive price tag, with a little practice you can do some amazing things with a laser welder that could easily justify their expense. properties. So welding, say, a platinum and 18 karat ring is no problem for a laser welder. Recently a client of mine sent me a platinum and 18 karat wedding band that needed to be sized for their customer. The ring was sized with no problems and was promptly returned to the client. 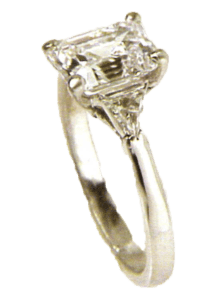 When my client received the ring, they were pleased that it could be done and then proceeded to tell me the problems they had trying to get the ring sized and subsequently making the sale. It seems that they had initially sent the ring to the manufacturer who returned the ring to them stating that it could not be sized and they would be happy to make their customer another ring in the appropriate size. That is when I received the ring. My lighthearted comment to my client upon hearing the story was, “I wish you had told me the ring ‘could not be sized’ before I sized it!” Sometimes laser welders can do the “can’t be done” jobs. This is one way laser welders can benefit your business. Another benefit of laser welding is building customer loyalty. You will earn the “can do almost anything” reputation. You certainly will be the jeweler who can do what the guy down the street cannot do. 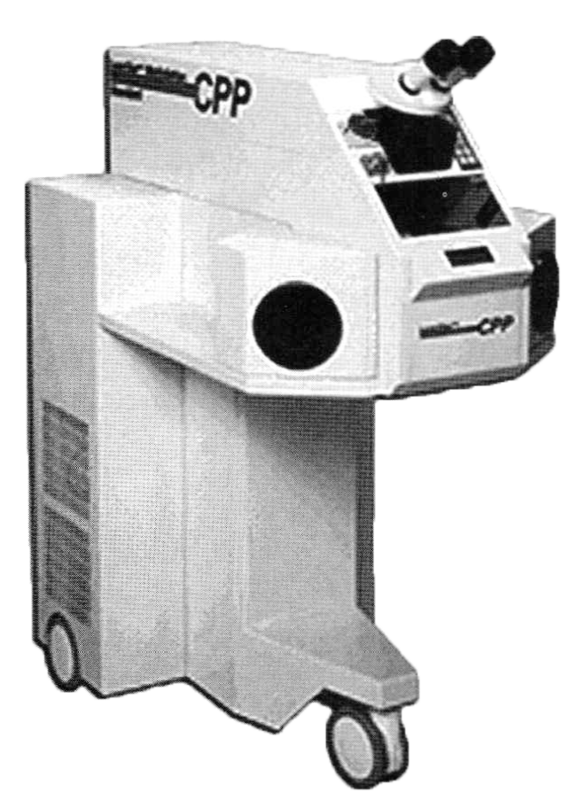 It shows that you are innovative and up to date on the latest technology. That puts your clients in awe of your skill and prowess as a jeweler, goldsmith, and platinumsmith. Your image as being knowledgeable and in control of difficult or “impossible” repair situations serves to build a sense oftrust and resultant comfort in your clients. Besides, lasers are a novelty, arouse curiosity and attract attention. It canbe good forbusiness. 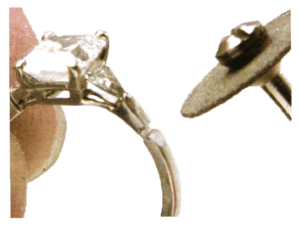 Since lasers literally weld at the speed oflight, they are also beneficial because they can speed up the time it takes to repair jewelry items. There is no need to apply a protective fire coating to the repair item and no need to pickle the item so the time this process would normally take is saved. Laser welders can benefit your business whether or not you own one. You can choose to invest in a welder or you can job out repairs that warrant laser welding to a service bureau or trade shop that offers laser welding’ You can still be the jeweler who does the “can’t be done” jobs if you contract it out to a laser welding service. This is like contracting out other repairs to a trade shop or casting to a casting service. Lasers, as many ofyou know from experience, can do some amazing things, but they are not a panacea. There are some repair jobs they cannot do and there can be potential problems with laser welding. Lasers can weld many metals, but they do not weld all metals. Thin gauge materials are more difficult to weld. Lasers tend to round or soften angles if you weld close to an edge. This requires extra build up and filing to restore the original shape of the piece welded. 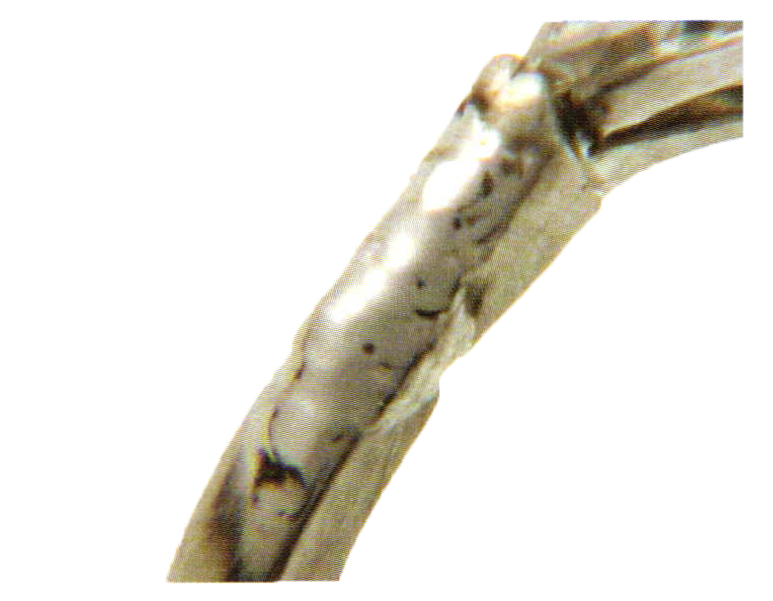 Unlike solder, laser welds do not flow through the seam of a joint. The weld is only as strong as the beam pulse penetrates the metal in the weld zone. Sometimes welds fail. There are primarily three reasons why this occurs. First, the metal to be welded is not conducive to laser welding. One example is titanium alloys. Pure titanium welds nicely with a laser using an ambient field of argon or some other inert/hydrogen free gas. 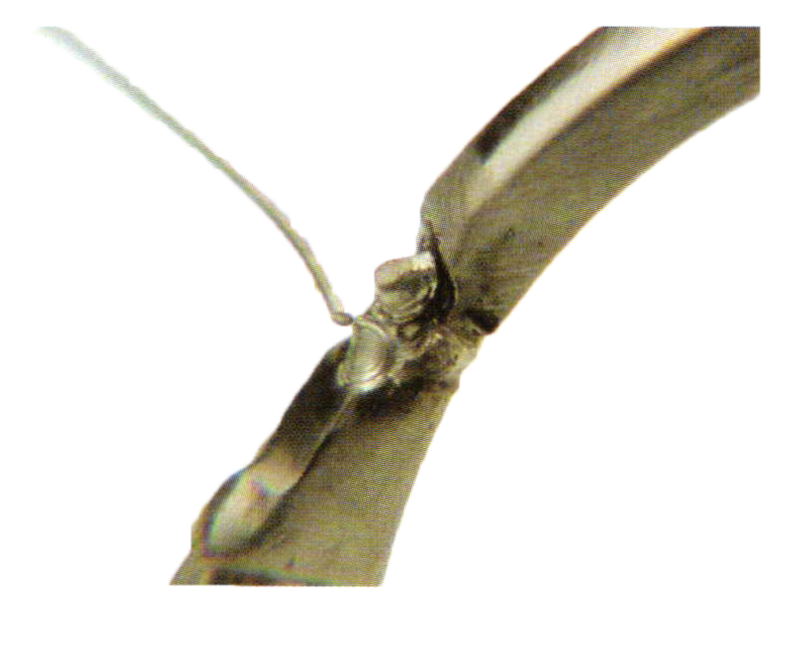 Titanium alloys are usually not welded successfully, but are typically brittle. Second, contamination of the original or host metal prior to laser welding by solders. 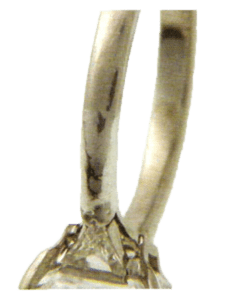 Most of you know what a problem lead solder is to gold items when attempting to repair the item by traditional torch methods. The same is true of laser welding where lead solder is present. The lead solder must be removed and if practical the contaminated section as well. 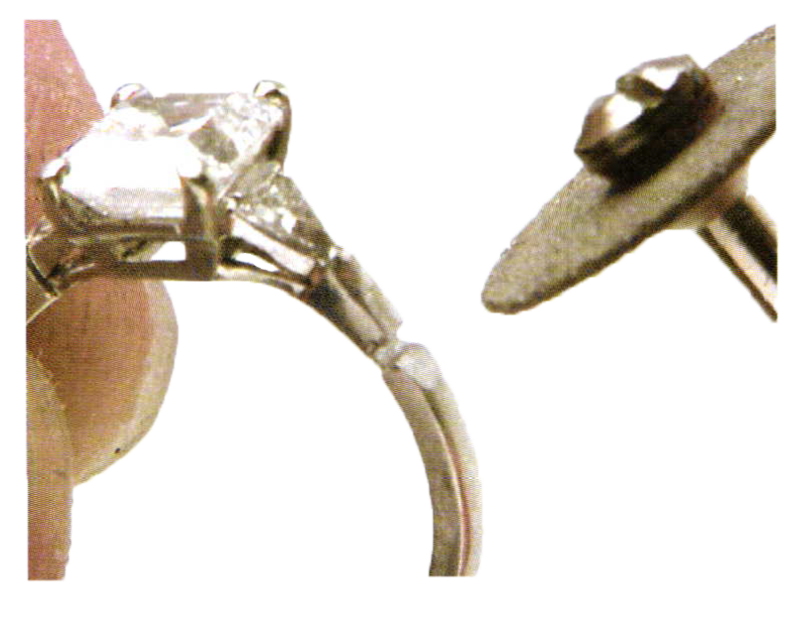 White gold solder on platinum and white gold items themselves can also be problematic when laser welding. 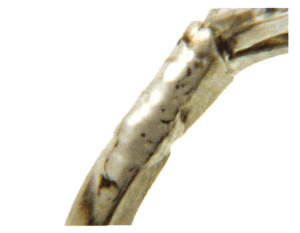 The zinc content of the solder “boils out” during the process of laser welding the platinum or gold because the zinc melts at a much lower temperature and cools at a different rate than the host metal, resulting in microporosity and a potentially brittle or inferior weld. Microporosity can also occur when laser welding white gold in azone that has no solder because of the zinc alloy in the white gold. Alloys with zinc, tin, or lead do not weld easily with a laser. The third and probably the most common reason for weld failure, and the one most easily remedied is failure to penetrate deep enough into the metal when welding. Surface welds can be deceiving. Unless you penetrate deep into the weld zone, the weld will be inferior and subject to failure. Since laser welds do not flow like solder does, what are some techniques for achieving strong laser welds? Basically, there are two approaches to achieving a strong weld. One approach is to increase the voltage, pulse duration (or milliseconds), and/or decrease the beam size. This will result in a deeper penetration on most metals, but can also have unwanted side effects. This type of pulse has much more energy and can cause the metal to overheat at the point of the weld and potentially vaporize some of the alloys and make a brittle weld. It can also have an explosive effect on the metal and move more metal than desired out of the weld zone. This is also known as “splatter.” When this occurs, the piece is traumatized, a crater develops and additional filler metal is required to complete the weld. Sometimes this approach causes more damage to the piece than was originally encountered prior to welding. If this occurs, renovation or reconstruction might be necessary. Instead of constructive welding, the effect is destructive. Time, and ultimately profit, is lost. There is a preferred method of welding that can achieve superior results and a stronger more complete weld. This method will be demonstrated with the following pictorial. 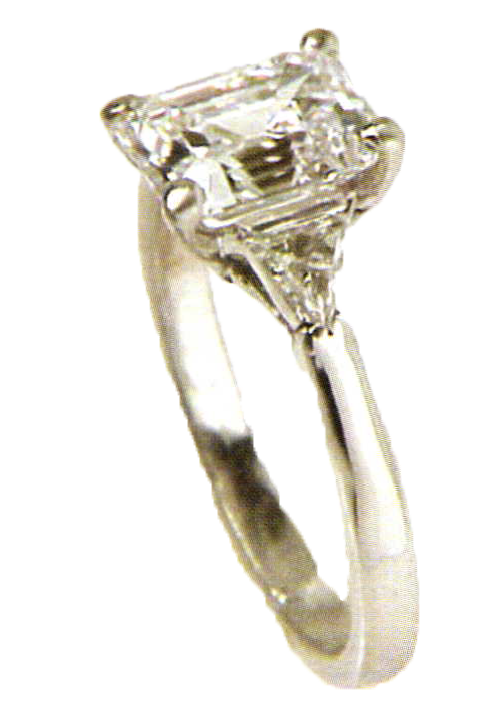 The example chosen is a platinum and diamond ring that has been previously repaired. 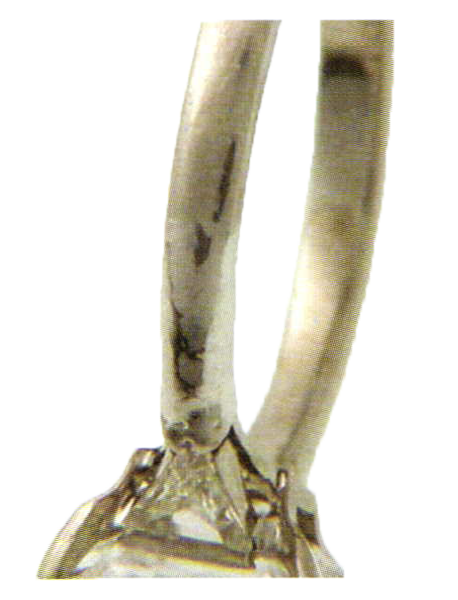 A half shank was installed using white gold solder of unknown karat. In this example, we will clean up the “contaminated” area and re-weld the joint properly using the preferred laser welding method. 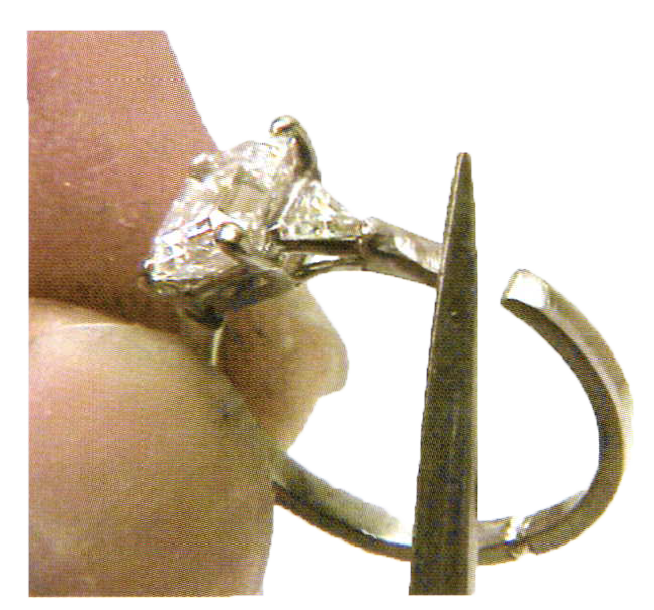 [Fig.1] Shows the ring in the condition received for repair. 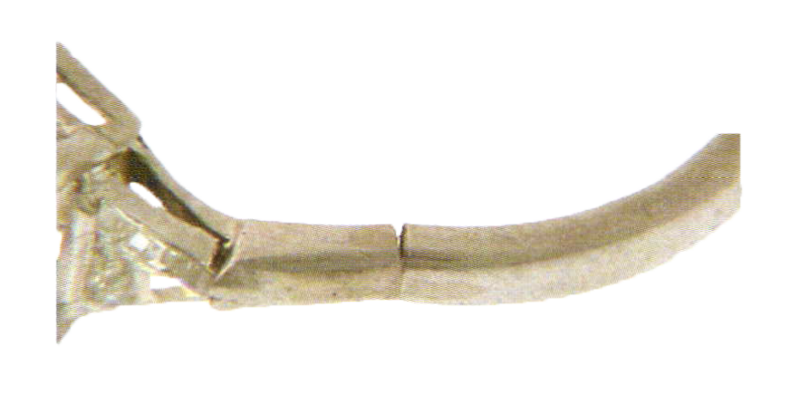 Notice the shank is broken in two places and the third joint on the other side of the half shank is suspect. We will repair each of these joints. [Fig.2] A closer look at the previously repaired area reveals the difference in color of the white gold solder and the host platinum metal. When the repair is finished, there will be no visible joints. [Fig.3] The first step is to grind or file away the white gold solder. We will do this one joint at a time in order to keep the piece intact and in the proper joint angle. Because the solder has probably permeated the platinum shank it may not be possible to remove all of the white gold solder. 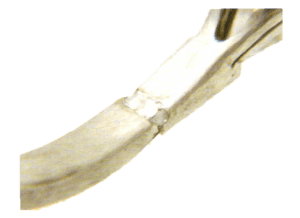 In this case, we will grind the solder contaminated area below the surface of the shank and then build up the joint flush to the appropriate surface for finishing. Ideally, the customer would be advised that a new full shank would be warranted, but in this case and for illustrative purposes, the customer opted not to replace the shank. [Fig.4] Once the shank has been filed to remove as much residual solder as possible, clean the piece and tack the pieces together from the inside of the shank. Here the laser settings are 330V 4.0ms O Hz 20 beam diameter. This will hold the pieces together for the next step. [Fig.5] Cut a groove perpendicular to the shank and extends ll2 to 314 the way through the shank. A separating disc works well for this. Be sure to clean and steam the groove area after cutting and before attempting to weld. Remember that lasers will joint dissimilar metals and substances. You do not want filings or dust from the silicon carbide disc or metal from the file to be joined to the platinum. [Fig.6] When you have cleaned the grooved area, you are ready to begin laser welding the joint. Select the appropriate setting and begin a technique called “landsliding.” I have chosen 330V 5.0ms 3.0H2 and beam diameter of 18. This technique moves the metal (imagine a mudslide or avalanche) from the sidewalls of the groove down into the bottom of the groove, building up the joint as much as possible with the adjacent host metal. This is a good time to weld the joint from the inside of the shank with a deeper penetrating weld. 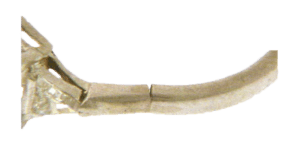 [Fig.7a] You will most likely be left with a depression in the joint. The depression is especially exaggerated in this example because of the filing of the shank to remove residual white gold solder. Using same metal wire as the host metal (30 gauge works well and our laser parameters are 330V 5.0ms 3.0H230 beam) begin to build up the joint to flush by touching the wire to the shank and welding at the spot where they both touch. This will melt the wire onto the shank and join it with the shank. The ring will probably heat up quickly beyond the point where you can hold it in your fingers. A note about parameter settings for laser welding. 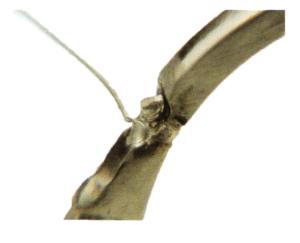 Laser welding is as much an art and a personally developed technique, as it is a science. Those of you who have been using a laser know this quite well. 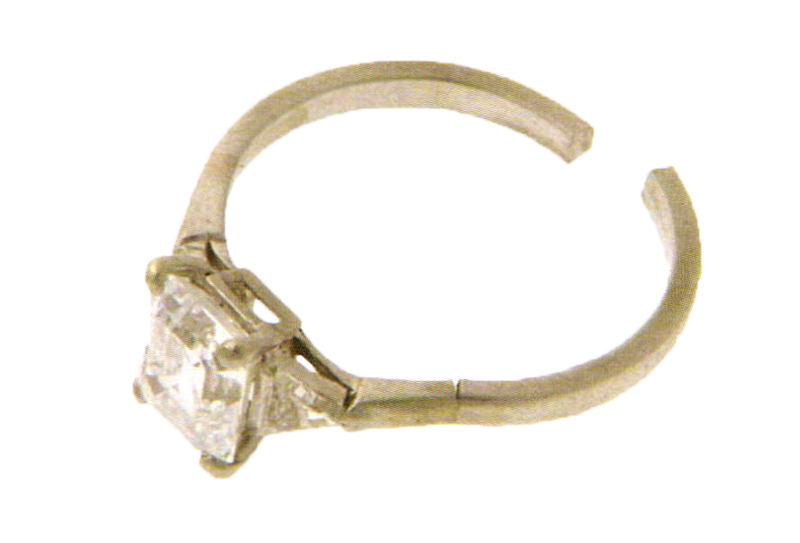 You also know there is little practical information available to the jewelry laser technician. 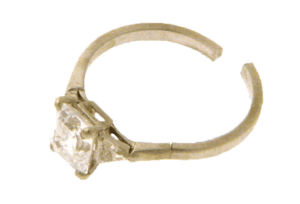 Most laser educators and experts I have spoken with over the past couple of years offer little helpful information to jewelry laser welders because of their lack of familiarity with our industry particulars. Hopefully this forum will contribute something in the way of practicality. Documented experimentation (parameter settings, adjustments for various metaltypes and thickness, with both good and bad results) along with idea sharing from others in our field are probably the best two suggestions to gaining a better understanding of laser welding. Experience, as in many other arenas, is still the best teacher. Experiment. Document. Tell others what you have done. There are basically no hard and fast rules. If a technique or parameter setting works for you, great! [Fig. 8a] Another advantage of laser welding is that the technician can blend the metal into the surrounding area. This can be done in a couple of ways. One way is to dilate or widen the pulse beam gradually (here using 330V 5.0ms 4.0H2 35 beam) and pulse the weld zone until a smoother finish is achieved. Another effective way to blend material in a weld zone is to vary the angle of trajectory of the laser pulse (330V 5.0ms 4.0H2 30 beam). [Fig. 8b] The idea is to cause an overlapping elliptical effect on the metal and blend it smooth. (A word of caution: when laser welding and when blending and smoothing be aware of what is in the background of the direction of the pulse. Stones can be destroyed and details can be damage by a stray or a ricochet laser pulse. [Fig. 9] Once you have blended the metal, you can finish and polish as you normally would. One nice thing about laser welding is that there are no visible seams when welding most precious metals With this technique you will typically have a strong joint that is nicely finished, and a very happy client. Laser welding is a new technology that has already made a significant impact upon the future of our industry. Lasers are evolving into the next generation models with the advent of pulse shaping, internal modems, and other advances. Though much is still to be learned about technique, lasers are extremely user friendly. Develop you own technique and share some of your tips and insights with others. Your business can benefit from owning a laser or by using the services of someone who does own one. 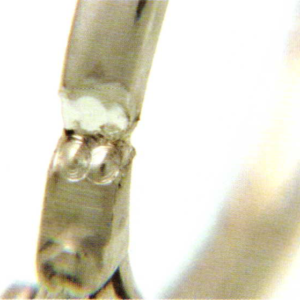 Lasers can do many repairs that jewelers traditionally turn down as a “can’t do” item. Let lasers help you in building your reputation, your business, and ultimately your bottom line. Bob Staley is owner of B. Staley, Goldsmiths / Precision Laser Welding. He has 23 years experience as a jeweler and goldsmith and over 2200 hours experience as a laser welder. If you have questions concerning lasers and laser welding or if you have a laser tip to share, contact him at bstaley2@bellsouth.net or call toll free 877-535-9938 or in the metro Atlanta 770-382-8268.